Please Note We Are Sold Out of the Black Concealment Vest in Large, XL, 2XL, and 6XL. We apologize for any inconvenience. It's a fact most handgun encounters occur at 20 feet or less. At such close range speed becomes a major factor. The Reactor Concealment Vest is designed to maximize draw speed, allowing instant access to the concealed carry pocket constructed of a durable snag free Cordura material. Elastic inside the concealed carry vest holster holds your weapon at the ready and a metal snap tab prevents the CCW vest pocket from opening accidentally. Of course we don't want you running out of ammo. Clever side pockets house up to six additional magazines with special Velcro tabbed areas for bullet storage. 22 pockets in total make finding a safe place for your car keys, cell phone, knife, pens and other important items fast and easy. Our CCW vest is the perfect blend of style, comfort, and usability designed around split second combat readiness for maximum personal protection. When placing your order, please follow our sizing chart in the description. 80% Polyester, 20% Cotton. When placing your order, please order one size bigger then you normally wear as the vest sizing runs small. If you are 5ft 5" to 5ft 9" and you weigh between 150-175, we recommend you order a size Medium. If you are 5ft 10" to 6ft and you weigh between 175-190, we recommend you order a size Large. If you are 6ft to 6ft 2" and you weigh between 190-210, we recommend you order a size X-Large. If you are 5ft 10" to 6ft 5" and you weigh between 200-220, we recommend you order a size 2X-Large. If you are 5ft 10" to 6ft 5" and you weigh between 230-245, we recommend you order a size 3X-Large. If you are 5ft 10" to 6ft 5" and you weigh between 250-265, we recommend you order a size 4X-Large. If you are 5ft 10" to 6ft 5" and you weigh between 275-290, we recommend you order a size 5X-Large. If you are 5ft 10" to 6ft 5" and you weigh between 300-320, we recommend you order a size 6X-Large. We understand that all people are built differently, these sizes are to give you general guideline on how our vest will wear. If you have any questions, please contact us on our website. The fit is great per the instructions and it is heavy enough for you to carry without leaning to one side or the other. Plenty of pockets and mag holders. Wonderful product and just what I needed. I wear for work, lots of pockets to organize equipment that I need to carry throughout the day. Plus it's an extra layer of warmth. At first I balked at the price but it has been worth every penny. Driving for a living where concealment is a must, this is a great product (revolver or semiauto) and is ambi for those lefties. Has room for spare mags plus more secure pockets to clear out all your pants pockets and more. Vest is great. Tons of storage, fits well. The only challenge I have is how much pressure it puts on my neck when I have gear in it. I will look to see if I can modify it so more of the weight sits on my shoulders instead. I like the quality. 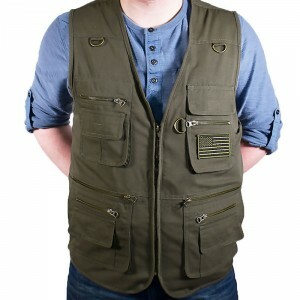 This is one cool vest you will like it. This is the second one I've order, they are just what a person needs. I ordered one size larger and the vest fits good. Lots of pockets and carry places for ammo and guns. Seems to be well constructed. Great piece of craftmenship...use it every day and it's also very comfortable. Love these vests and will purchase others. A solid vest for the money. Able to carry my glock 23 with no problems. Only issue is the sizing runs a little big. I normally wear an xl shirt so I bought the xl vest, it was significantly big on me. I kept it to wear in the fall months over sweatshirt and purchased a large for the summertime. Item arrived in great condition. Fit is a touch big but with washing and left to dry in sun it has shrunk up a little bit. Love all the pockets but it lies slim to body with no bulging. Great item. So happy I ordered it. Excellent!!!!! !